A ‘normal’ person’s breakfast routine allows the luxury of mindlessly upending a box of cereal into a bowl, while bumbling around the kitchen wiping the sleep out of their eyes. While we don’t actually have to go out into the wild to catch our breakfast, for us Paleo Pioneers it can sometimes feel a bit, well, unjust that we have to rustle up a whole meal as soon as we wake up. So I’m all for making breakfasts as easy as possible. Anything that can be made in bulk the day before and assembled with minimum supervision is good. 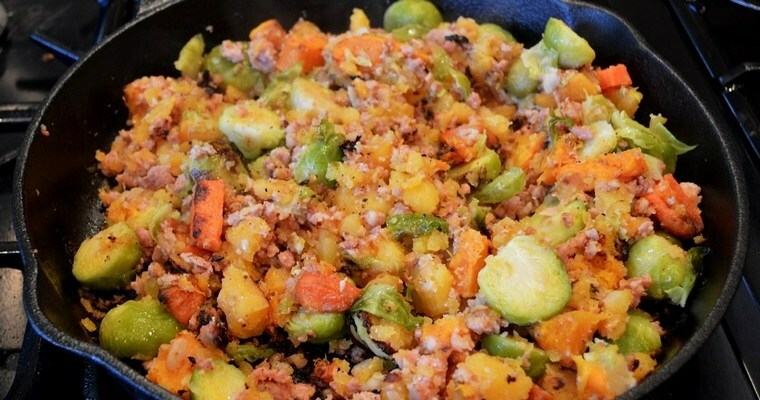 Hash is a great Paleo breakfast because, not only does it tick these boxes, but it’s also a great way of using up leftover vegetables from the night before. It positively thrives on neglect because, while you leave it frying in the pan to multitask on procuring a cup of coffee etc., a beautiful crust will form on the bottom of the hash – which rather fortuitously is just what you want in a truly great hash! You can also add baked eggs to the dish by making wells in the hash mix and cracking in eggs. If cooking in the oven, add the eggs for the final 10 minutes. The night before, cook the hash. Boil the swede. Put the swede in a large pan and cover with salted water. Bring to the boil then reduce to a simmer. Cook for 30 minutes, or until tender. When cooked, very roughly mash, and stir in the nutmeg, salt and pepper. Steam the vegetables. Meanwhile, steam the remaining vegetables. Put the sweet potato in a steaming pan over a medium heat. Steam for 20 minutes, adding the carrot and brussels sprouts after 8 minutes, so they steam for 12 minutes. If using cabbage instead of brussels sprouts, allow to steam for 6 minutes. When all the vegetables are cooked and tender, empty into a colander and leave to steam dry. Fry the sausage. Meanwhile, heat 1 tablespoon of the cooking oil in a frying pan over a medium heat. Shuck the sausages out of their skins and crumble into the pan, breaking up the meat. Fry for 10 minutes, or until cooked through, stirring occasionally. Once all the ingredients are cooked, combine in the large pan and mix together with a wooden spoon. Taste, and adjust the seasoning if necessary. Once cooled, transfer the hash into an airtight container and refrigerate. It will keep for up to 5 days. In the morning, heat some cooking oil in a heavy-based frying pan over a medium-high heat, and add the hash mix. If cooking a single portion: cook for about 10 minutes, or until a crust has formed on the bottom, turning over halfway through. If cooking the whole lot: cook for about 10 minutes, without turning. Place in a preheated oven at 190°C/375°F and cook for 20-25 minutes, or until a crust has formed on top. Transfer to a plate. Garnish with the fresh herbs.